Where legends come alive, get started to find a Japan tour! Explore the secluded wonders in Kyushu & Shikoku, Japan's southern islands shrouded in legend & mystery during a fully escorted Southern Japan Tour Vacation. Venture south to the scenic islands of Shikoku and Kyushu, and enjoy the rural charms of Japan! Legend states, when Susanoo, god of storm, terrorized Amaterasu, his sister and sun goddess, she hid in a cave plunging the world into darkness. The cave exists in a small town in Kyushu called Takachiho. The Tour of Hell path in the Kannawa is the highlight of sightseeing in the Beppu spa. Enjoy the Sea Hell, the Blood Pond Hell, and the Tornado Hell, a fiery geyser. Awaodori Kaikan is a museum on the prefecture's famous traditional dance, Awa odori. 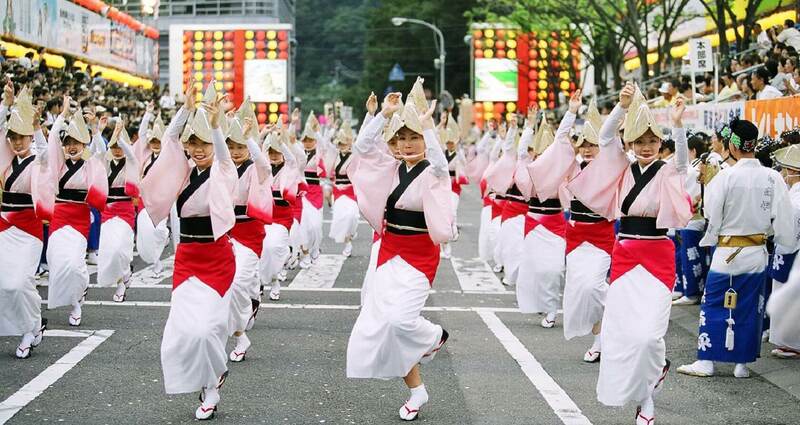 Awaodori Kaikan was opened to entertain and teach guests about Awa Odori and its history. 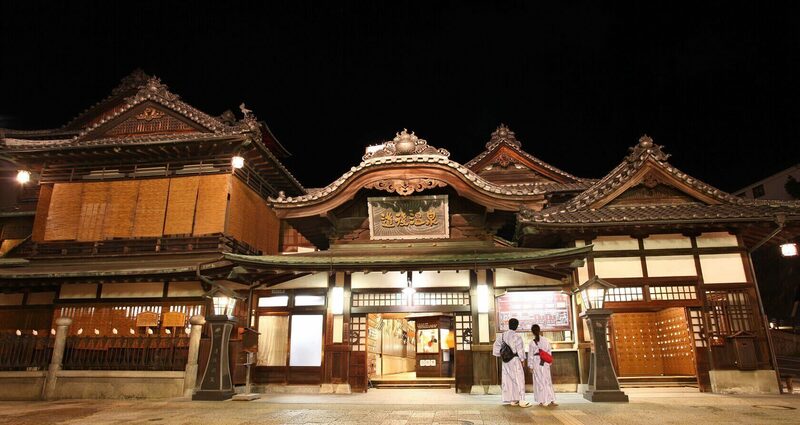 Inspiration for "Spirited Away", Dogo Onsen is one of the Japan's oldest and most famous hot springs. The area is popular with tourists for its beautiful bath house and many ryokan. 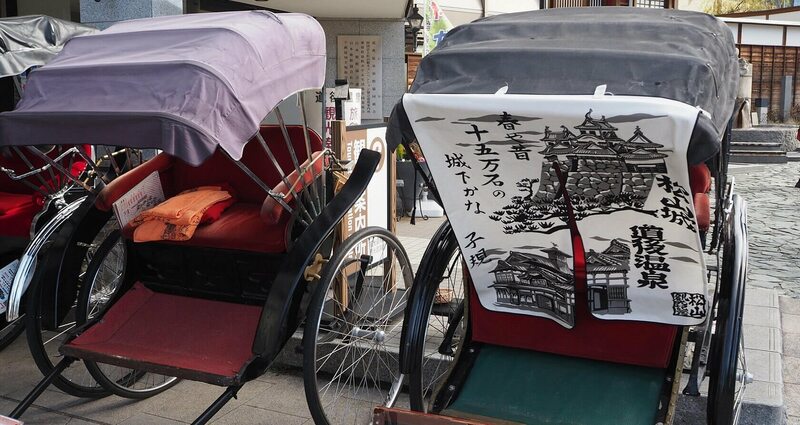 Jin-Riki-Sha (Japanese Rickshaw) is two-wheeled cart pulled by a single person to carry one to two passengers at a time. Jin-Riki-Sha is translated as: Jin= human, riki=power, sha=vehicle. Kumamoto Castle is considered one of the three premier castles in Japan. A large and extremely well fortified castle, several ancillary wooden buildings of the original castle still stand. Miyajima Island is the popular name of Itsuku-shima Island with Itsushima Shrine, located in Hatsukaichi City in southwestern Hiroshima. For the adventure seeker looking to go beyond the flashy lights of the city, our Southern Japan Tour packages are designed to show you a the charms of Japan you can't experience in the bigger cities like Tokyo or Kyoto. Starting in Osaka, we will travel to the southern regions of Japan, including the mythical spots of Kyushu and rustic allure of Shikoku. These two islands capture the spirit and essence of a more traditional feel for Japan. 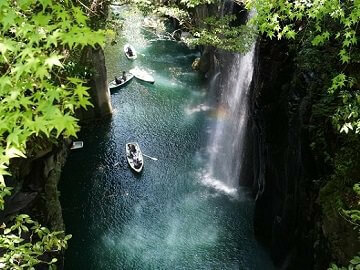 Visit natural wonders that influenced Japan's deep connections with nature, including the breath taking Takachiho gorge, or while walking through the Zen-inducing Ritsurin Garden. 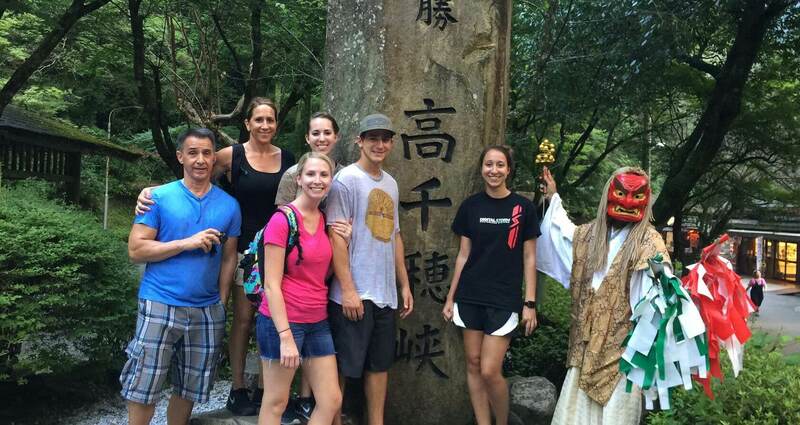 We include all the stops that capture the Japanese Experience while still keeping things fresh and unique so even the most season travelers can enjoy our tour package. These tours also visit Kumamoto, which was struck by an earthquake in 2016 and has come a long way since. 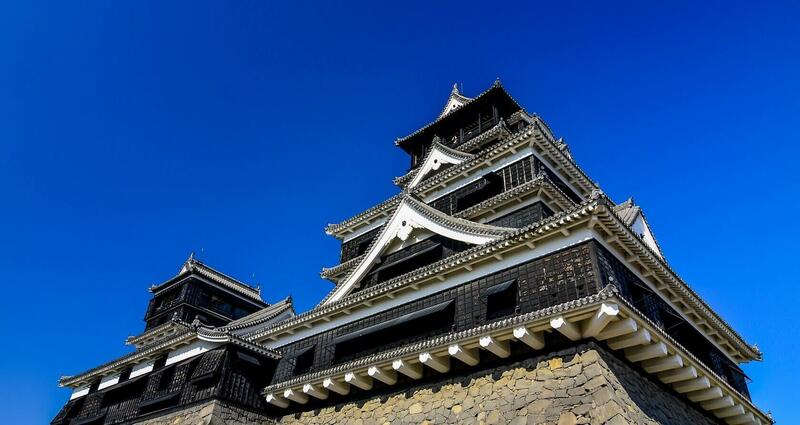 Feel the spirit of resilience and inspiration while visiting the famous Kumamoto Castle! 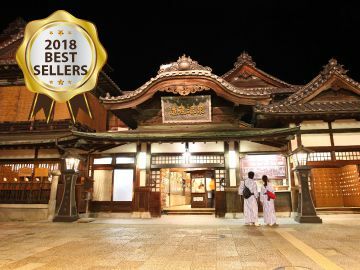 Come explore the secluded wonders and be the first among your friends to explore this uncharted territory through Kumamoto, Beppu, Matsuyama, Kagawa, Tokushima, and more! Similar to our 8 day tour, enjoy Japan's lush spring season while you explore the southern treasures of Japan during our Cherry Blossom Essence of Spring Southern Japan Tour 7 Day package. 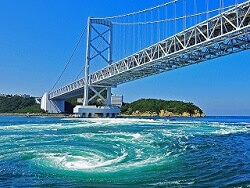 We include the best spots of Hiroshima, while taking in the best sights of the southern islands. Enjoy the charms of Japan without the crowded atmosphere you'd find in other parts of the country. Discover the natural beauties of Kyushu and Shikoku, including temples, shrines, and some of the most awe-inspiring nature locations Japan has to offer! When the cherry blossoms are in bloom, the whole country partakes in enjoying the beauty of the season. Enjoy seeing cherry blossoms through the best spots Southern Japan has to offer during this seven day adventure. You can also extend this tour before/after your stay in Osaka! Cherry blossoms make every destination from Hiroshima to Osaka unforgettable on this southern journey! Release yourself from the shackles of ordinary while exploring the nature-filled marvel that is southern Japan. Our Highlights of Southern Japan Tour packages are the ideal packages for those who want to visit Japan, without being too caught in all of the sight-seeing in popular destinations like Tokyo or Kyoto. 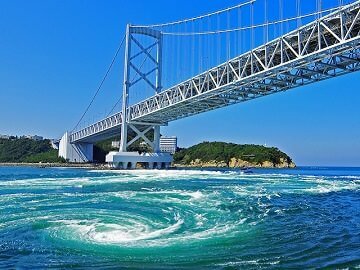 Travel south through Hiroshima and the southern islands of Shikoku and Kyushu for memories and amazement. This unique fully escorted Highlights of Southern Japan Tour highlights the charms of the southern islands, showcasing the finest attractions in Hiroshima, Nagasaki, Himeji, Kumamoto, and so much more. 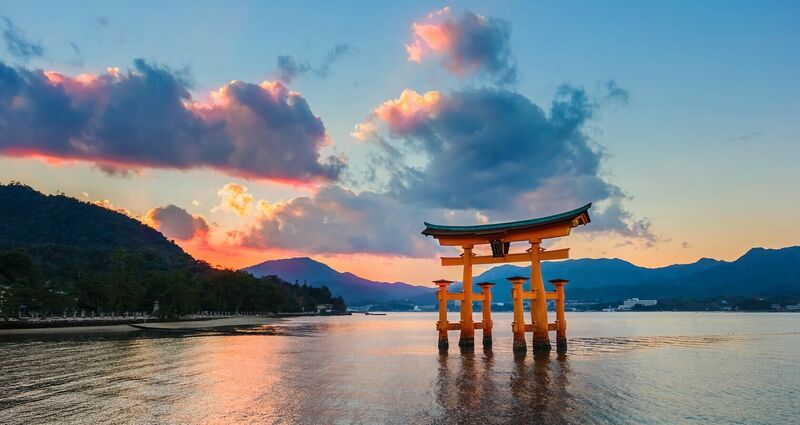 Enjoy the famous floating torii gates of Miyajima, and the Hiroshima and Nagasaki Peace Parks while we visit myth-inspiring attractions like Dogo Onsen and Takachiho Gorge. 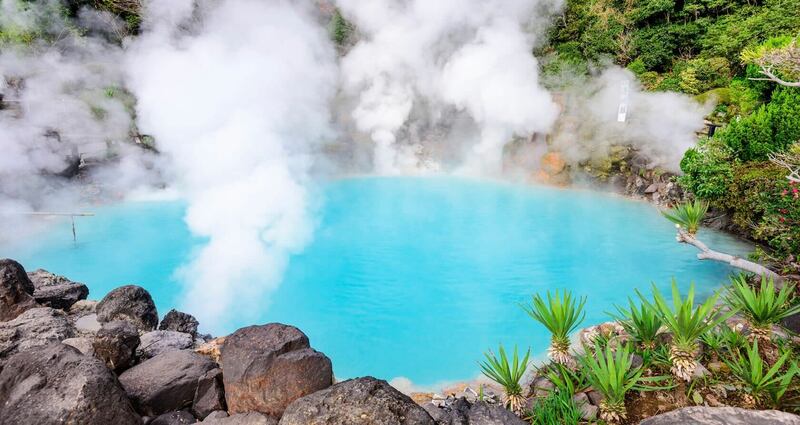 This tour includes plenty of cultural experiences to immerse you in Japanese culture, including a stay in a Japanese style hotel where you can take a relaxing dip in the hot springs. Enjoy local specialties during your tour and see the best of southern Japan during your stay. You can also extend your stay in Japan before/after your Japan tour in Osaka! Journey past the ordinary to locations tourists don't always explore. Join us for an unforgettable journey through southern Japan during our Southern Japan Tour package for the Summer! Heat things up with a nature-filled vacation that captures the traditional feel of Japan, without having to visit the densely packed cities of Tokyo or Kyoto. Our packages are ideal for the traveler looking to see something new, without sacrificing key Japanese experiences! Our Southern Japan Tour - Summer packages crafted to provide the ultimate experience when traveling through Shikoku & Kyushu. Begin your tour in Osaka and make your way through the various islands, stopping at the must-see locations along the way. Take thousands of photos by the end of your journey, and enjoy sampling some of the freshest flavors and local specialties you won't get elsewhere. Enjoy Osaka, Hiroshima, Himeji, Kumamoto, Miyazaki, and so much more while you find yourself in Japan's country-side. You can also extend your stay before/after your tour in Osaka! Transcend past the ordinary during a vacation through Hiroshima, Kyushu, and Shikoku! Our Essence of Spring - Cherry Blossom Japan Tours cover the must-see spots of Japan during Sakura season. Enjoy a Cherry Blossom Tour while Sakura bloom in Tokyo, Kyoto, Nara, Osaka, Hiroshima, and Southern Japan. Anime & Manga are integral parts of Japanese culture. Japan Deluxe Tours has organized several Japan Anime tours for anime and manga fans to visit Japan's Largest Anime Festival AnimeJapan. Relive your favorite anime moments and add limited edition collectibles to your impressive anime and manga collections. Our Highlights Japan tours showcase the best in Tokyo, Hakone, Kyoto & Nara! Explore Akihabara's Anime culture or add a Hiroshima Tour on this blend of old & new! Tour Little Kyoto during our Takayama Festival Japan Tour Packages in April & October! 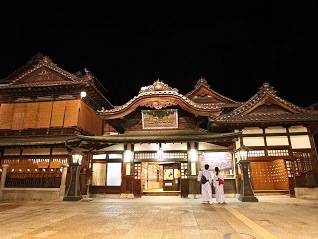 Enjoy beautiful Edo style buildings during the spectacular Takayama Festival celebration. The Gion Festival is one of Japan's most famous Matsuris, attracting hundreds of thousands yearly. Enjoy a Japan Tour package during Kyoto's most popular festival for an unforgettable summer journey. Join the largest quilt event in the world in Tokyo with all of Japan's can't miss handicraft & stitch art spots on a fully-guided Quilt Japan Tour! This Japan tour includes a lunch with a Kyoto Maiko, Japanese sake tasting, a rope-way ride in Hakone near Mt. Fuji, a soak in a traditional hot spring in a Japanese style hotel, and more. Our Grand Japan Tour packages are dynamic vacations that cover Tokyo, Kyoto, Nara, Hiroshima, Kyushu and Shikoku. Enjoy temples, a bullet train ride, and a tea ceremony during your Japan adventure. Embark on a journey to learn about your family's Nikkei ancestry. Our Nikkei Ancestry Tours feature all the essential stops from Tokyo & Yokohama to Kyoto & Hiroshima. The perfect vacation, our Winter Japan Tour packages include seeing adorable snow monkey while enjoying Japan's traditional culture on this Winter Holiday vacation! 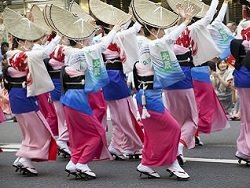 Uncover the northern region of Japan during our Hokkaido Tours or venture out to experience Tohoku's three major festivals, including the Kanto Festival in Akita, Nebuta Festival in Aomori & Sendai's Tanabata Matsuri. Already planning a cruise vacation? Why not extend your travels with a Japan tour package after pulling into port? Look up dates, times, & port information on our convenient Cruise Connecting Japan Tours page. Enjoy shades of red & orange leaves through Tokyo, Kyoto, Osaka, Hiroshima & Southern Japan during our Autumn Japan Tours!